Canada is suffering a high number of casualties in the war in Afghanistan. It has become customary to pay respects to soldiers who have died in Kandahar along Highway 401 in Ontario. The stretch of road their caskets travel from Trenton to Toronto has been renamed ‘Highway of Heroes’. Wearing winter coats and hats, Steve and Wendy Robbins stand on an overpass over Highway 401 in Ontario. Steve is holding a Canadian flag on the edge of the bridge near their hometown of Brighton, a 1.5 hour drive east of Toronto. Along with dozens of others, they are waiting in freezing weather to pay their last respects to three Canadian soldiers who died on the weekend in Afghanistan. The couple regularly comes to this spot to honour the casualties suffered by the Canadian army, which has about 2,500 troops in the southern Afghan province of Kandahar. Soldiers killed in the mission make their final journey in Canada on Highway 401, from the Canadian Forces Base Trenton to the coroner in Toronto. It has become customary for citizens to stand along the road and on bridges over it, to pay their last respects to the fallen with flags and applause. 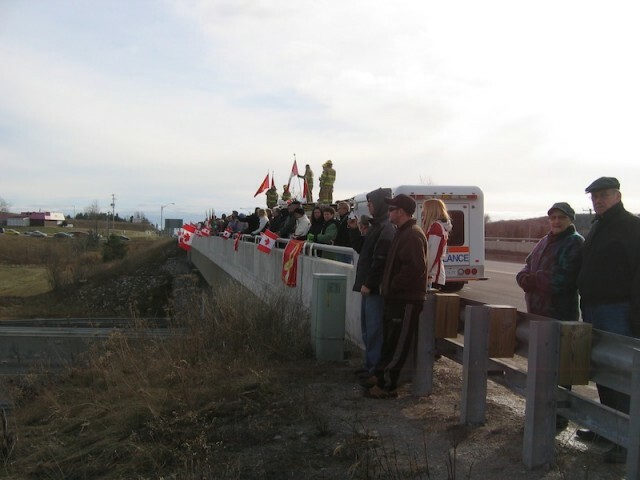 Canadians wait on an overpass for a cortege with the remains of soldiers who were killed in Afghanistan. Yesterday, that sad task had to be performed for the second time in eight days. The bodies of three Canadian soldiers who died on Saturday when a bomb exploded during a patrol west of Kandahar City arrived back on Canadian soil. Earlier this month, three others were killed in a similar attack. The latest ambush has brought the Canadian death toll over the 100 mark; it now stands at 103. Even more reason for thousands of civilians to brave the winter weather along the route, which has been renamed ‘Highway of Heroes’. Still, the milestone has reminded Canadians of the high toll their country is paying in Kandahar, a stronghold of the former Taleban regime. Attacks by insurgents have increased by 50 per cent compared to last year, to nearly 1,000. Military objectives appear to have been scaled back from making territorial gains on insurgents to preventing loss of areas to them. Meanwhile, humanitarian aid, which is what the Canadian population would like to see as the focus of the mission, is difficult. The three soldiers killed were part of the force protective unit of Canada’s Provincial Reconstruction Team, a group of military personnel, diplomats and civilians responsible for development projects in Kandahar. On the Trenton air force base, the military plane bearing the victims has landed. In what has become known as a ‘tarmac ceremony’, their flag-draped coffins are carried solemnly from the aircraft. Soldiers salute them. Family members watch in tears and lay flowers, as the coffins are pushed into black hearses. Canada’s Governor-General and Minister of Defense are present. The chilly silence is broken only by the plaintiff sounds of a bagpipe. Army commanders in Kandahar have warned of further setbacks. The arrival of thousands of U.S. troops in southern Afghanistan next year will likely lead to more attacks, predicted Lt.-Gen. Michel Gauthier this week. Once the Americans are in the majority next year, Canada will transfer command of the province to the U.S. The Canadian mandate was renewed to 2011 this spring by the government of Prime Minister Stephen Harper. During the election campaign in the fall, Harper said that he was not in favour of further extension of the combat mission in its current form. That did not stop U.S. Secretary of Defense Robert Gates from hinting at that option when he praised Canada’s contribution in Afghanistan during a visit to Kandahar last week. “The longer we can have Canadian soldiers as our partners, the better it is,” he said. On the tarmac, the hearses are ready for departure. Relatives get into cars to join the cortege. Escorted by police, the procession exits the base and heads towards Highway 401. People line the streets of Trenton. Once the procession is on the highway, police officers block entrances. Behind the funeral procession, which picks up considerable speed, a lump of regular traffic builds up. On every overpass heading west, people are standing with flags.